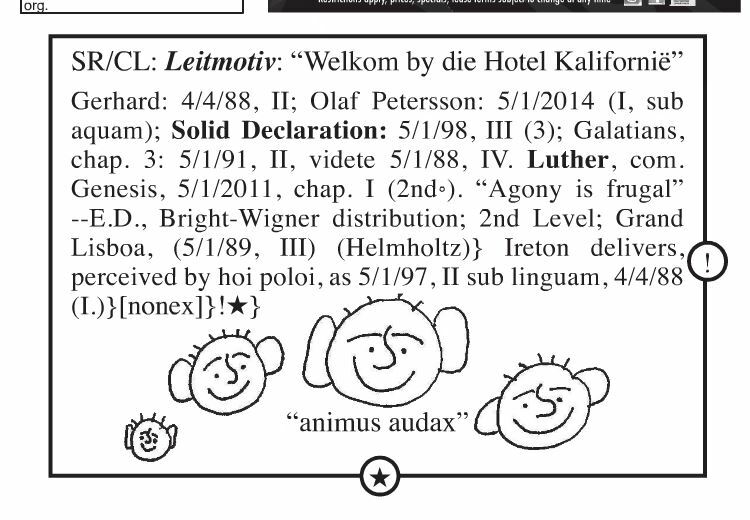 The "Leitmotiv" at the top of the page is a translation into Afrikaans of the lyric "Welcome to the Hotel California" - from the song by the Eagles. translator would know not to translate proper nouns (like the name of a hotel). traditionally, the majority of Afrikaans speakers in South Africa are (at least nominally) members of one of South Africa's Calvinist denominations). Luther may be a reference to the Lutheran Bible, maybe Genesis chap I 2nd verse.
" Und die Erde war w�st und leer, und es war finster auf der Tiefe; und der Geist Gottes schwebte auf dem Wasser "
" And the Earth was without form and void, and darkness was upon the deep; and the Spirit God swept over the water "
Also, where it says Leitmotiv: "Welkcom by die Hotel Kalifornie" is an obvious reference to the song Hotel California. The theme (leitmotif) being stuck in an inescapable situation. Page top: "Welcome (by?) to the Hotel California." Might be a reference to the Eagles song. Galatians chap. 3: Either a chapter explaining how acceptance of Christ leads to blessings, or condemnation of blindness to the Lord's miracles. Lisboa: Lisbon is the capital of Portugal. I did not bother, but perhaps they may be referencing earlier entries. Good look to everyone else! Oops, forgot something - "animus audax" (underneath the smilies) means "His mind, reckless." Could be another quote, not sure. Surely hoi poloi here is an error for hoi polloi, i.e. the common people, the uneducated masses. These errors seem to be creeping into the texts recently.